My real life friend, Jennifer, has been busy whipping up some beautiful needle felted items lately. I have tried to comment on her blog but Blogger just does not like me! So instead, i am sending you all over there to check out her creations. 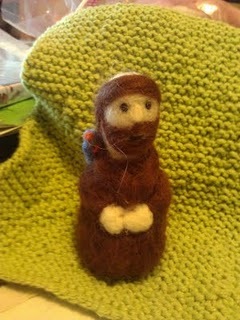 Her latest is this beautiful St. Francis doll. Her blog is Homespun Love. Stop by and check out her creations! I would love to have her do a felted doll tutorial sometime, so be sure to mention that for me if you can leave a comment! Hey,Allison - - thanks for the suggestion. I will try to get pictures together for a tutorial on felting the dolls. Mary showed us how to make the dolls by crafting a Blessed Mother. I believe she got the inspiration from a "Living Crafts" magazine. I did see your post where you talked about MaryB showing you how to needle felt. Cute dolls! Your Saint Francis is beautiful (as are most of the stuff you create once you get the hang of something!) I have looked online a bit off and on for quite a long time about needle felting. BUT i have a feeling, if you can get some pictures, yours will be one of the better tutorials out there! It was great to see you at the Conference!